Do Brain Scans Improve Diagnostic Accuracy? Starting with CT scans, then head ultrasounds, MRIs and now fMRIs and Diffusion Tensor Imaging, brain scans have given us progressively more detailed pictures of the brain. The problem is that the correlation between what looks like damage and outcome is far from perfect. The CT scan shows evidence of massive early brain injury and yet the child did far better than expected. Equally, some babies with a relatively normal or completely normal scan have lots of problems later on. It was this confusion that led me to do a 2-year postdoc in England. The first year was at Hammersmith Hospital with the world’s foremost baby brain neuropathologist, Jonathan Wigglesworth. Together we wrote a book on perinatal brain injuries that was published way back in 1979. By the end of the year with Jonathan, I had learned an incredible amount about the causes and timing of both IVH and PVL and I thought an accurate diagnosis of “at risk” babies was just around the corner. In my second year of postdoc work, as a senior registrar at University College London Neonatal unit, I had the great good fortune to have access to an ultrasound machine that was being tried out for intrauterine diagnosis. I persuaded the research obstetrical registrar to allow me to have the ultrasound unit between 5 PM and 9 AM. We were able to see both IVH and PVL with this early machine and we published the first paper using ultrasound scans in newborns. I was convinced that these lesions, seen on early scans were going to allow me to more accurately diagnose a neurological problem. 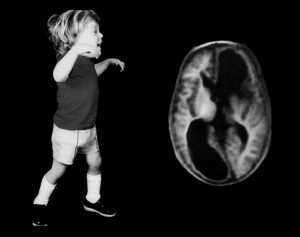 Nearly 40 years later, I find that the most common diagnosis after an early brain lesion is still Cerebral Palsy, the generic term which is effectively useless in leading you to a specific treatment plan. All it means is that something went wrong with the brain (cerebral) causing weakness and/or spasticity (palsy) early in life. Rule 1 is do not accept CP as a diagnosis. Push for a more specific term that usually will indicate which functions are likely to be involved. The common terms are hemiplegia meaning one arm and one leg, diplegia meaning both legs are involved or quadriplegia which affects all four limbs. In each of these groups, the tone of the affected muscles may be increased (spastic) or decreased (hypotonic). These terms are an improvement on CP as a diagnosis, as they indicate the specific body areas that need help. The frustrating part is that children with a more specific diagnosis still rarely get specific treatment. Hemiplegia involving one arm and one leg is the most common form of CP affecting 39% of children. I will talk about hemiplegia this week and move on to the other common forms of CP in the following weeks. Rule 2 also comes into play for a child with a diagnosis of hemiplegia. You have to ask for a sub-classification of the specific type of hemiplegia. There is a preterm, a full-term, and an early childhood pattern. Parents know when their baby was born, but the complication is that the pattern is determined by when the brain was actually damaged. For example, you can have intrauterine brain damage in a baby, producing a preterm pattern, even though the baby was born at term. Fortunately, in most cases, the parent can determine the pattern fairly easily. The preterm pattern of hemiplegia affects the leg more than the arm and rarely affects speech and language. The damage is in the periventricular white matter (PVL) on one side. It can be caused by an extensive IVH extending out into the brain (a grade IV bleed) and/or periventricular leukomalacia (PVL) that is extensive and usually described as cystic, again mainly on one side of the brain. Hemorrhage and PVL can coexist in the same baby. The full-term pattern of hemiplegia affects the hand, arm, upper body, and speech more than the leg. The damage on the affected side is a gray matter lesion that extends from the surface of the brain inwards towards the ventricles. The post-term infant pattern of hemiplegia is caused by a middle cerebral artery stroke or bleeds that affect the motor control of the upper limb more than the lower limb. It is slightly more likely than the full-term pattern to involve speech and language. What about severity? This is commonly measured by the GMFCS scale. In children diagnosed with hemiplegia, 99% are mildly affected at Levels I to III. Only 1% of all the children score at level IV or V, the moderate and severe levels. It boggles my mind that parents are not given this information in 2014. What this means is that all children with hemiplegia walk eventually. If they do not walk, there is an additional problem and it cannot be blamed on the hemiplegia. Initially, they will walk with a variable degree of difficulty, but the long-term outcome is good. The best outcome results are found in children with the preterm pattern and the most difficulty occurs in the post-term pattern. The arm and hand use is also better in the preterm pattern than in the post-term pattern. There is a common problem that haunts the field of CP treatment that parents need to understand. Therapists focus on different parts of the body. The Physical Therapists and the Occupational Therapists split the body at the umbilicus with the PT doing the lower limb and the OT doing the upper limb. The SLP (Speech) Therapists’ focus is above the neck. The insurance agencies and government systems have perpetuated this separation of the child into three unequal parts by sending your PT, OT and Speech Therapists in on different days, working on different goals and rarely communicating with each other. This is like a baseball team without a head coach. You will hear me say over and over again that you, as a parent, have a right to demand that your therapists communicate with each other on an ongoing basis and integrate their therapy plans to one goal at a time. This brings me to Rule 3 for hemiplegia…the three things that you must worry about and tend to first. A. The trunk comes first for all patterns. You cannot learn to move without a stable trunk. Nor can you speak if you do not have good breath control. I have covered the importance of trunk control in the post First the Trunk, Then the Ankle – Spasticity #5 and it should be reread. The problem is that a child with hemiplegia is considered “not too bad”. They are rarely given the proper trunk strengthening exercises or trunk support that they need early in life. Ultimately every child with hemiplegia will develop some trunk control, but they will develop it asymmetrically. One side of the trunk works and the other side does not work as well. In order to get the trunk to work properly, you are going to have to support it, in alignment, until the child is strong enough to do specific exercises. B. You have to see the hand to learn to use it. Upper limb taping and splints to keep the hand in alignment and in the visual field are needed early (Back to Basics, Alignment Comes First). Constraint induced movement therapy (CIMT) and/or hand arm bilateral intensive training (HABIT) are proven, useful techniques. They should start early and they should continue on an intermittent basis as the child matures and is able to learn new skills. C. Good form is important from the start. Children with hemiplegia will get to standing and the tone, particularly around the ankle and knee, needs to be controlled early. I believe that children need AFO’s as soon as they stand. An adult with stroke has an AFO fitted in the hospital. While there is some controversy about unilateral or bilateral AFO’s in hemiplegia, in my experience, it is best to start off with bilateral AFO’s so that the child can balance easily. As they become more competent in the upright position you may be able to get away with just a unilateral one. None of these interventions should wait until the child is officially “diagnosed” with CP at 3 to 6 years. For the older child who has missed this early approach, it is never too late. Check with your therapists and physicians and treat contractures/fixed tone first. Parents need to demand appropriate support to keep the limbs in alignment and functionally capable of responding. I would be very interested to hear from parents of children with hemiplegia on the timing and quality of therapy they have received. Has your child received the ones that I am recommending? Next week’s focus is on diplegia, primarily affecting both legs. Pape, K.E., and Wigglesworth, J.S. : Haemorrhage, Ischemia, and The Perinatal Brain. Clinics in Developmental Medicine, Spastics International Medical Publications. William Heinemann Medical Books Limited, London, and J.B. Lippincott Company, Philadelphia, 1979. This information is incredibly useful for parents. However, I wonder how it would apply to my son, who is non-spastic. He was full-term, with his injury happening at birth. He has hypotonic and dyskinetic cp. He uses both sides, but is stronger and favors his right. For instance, he will sometimes pick up a toy with the left hand and transfer it to the right to play with it. If he gets the right support, he may cell morph into a more hemiplegic pattern. At some point, a brain scan may also give you some valuable information, both about the normal looking brain as well as the areas that were damaged. More orthopaedic surgeons need to be trained in Dr Roy Nuzzos procedure from Summit New Jersey, they are also doing it in Japan and India under Dr Deepak Sharan at RECOUP, minimally less invasive multi level surgery. It does work, I am nearly 13 years post op, no recurrence at all. Thank you for the comment Christine. I have followed Dr Nuzzo’s work for many years and I have been impressed by his results. I agree it is too bad so few surgeons have not adopted the technique. I suggest parents ask the question of their surgeons. This is a recent article on the technique. Owen received his diagnosis of hemiplegic cerebral palsy when he was 18 months old. We also did constraint induced therapy just before his diagnosis. The week his cast was removed he began crawling for the first time, was soon pulling to stand, and with the help of SMOs was walking independently by 21 months. Now, just a week before his second birthday, his main issue is right hand dominance with almost no issue with his leg. I desperately wish I had found you in our NICU days. Our neonatologists had a very “wait and see” attitude, but thanks to an aggressive pediatrician, we obtained therapy for Owen around 6 months old when we first began noticing his hand preference and refusal to bear weight on his legs. Are the findings the same for full term vs preterm patterns for spastic diplegia as compared to spastic hemiplegia? My son was diagnosed with CPSD and is very close to being an independent walker and is getting better and better at gross motor skills, but his speech is severely deficient. He had a traumatic birth and from what I’ve read, it is the at birth damage that is most likely the cause for his sever speech delays. Any thoughts? What a great article. My daughter has right sided hemi. As parents we had concerns about her physical development at 15mths but were told to wait and see. You see, she is very mildly affected. At 18 months we noted that her right arm came up into typical cp position when she started to run. After being the assessed for leg length discrepancy she was diagnosed. From reading your article I believe her difficulties must have been pre term. Her arm is barely affected, only lifting to cp pose when concentrating hard. Doing anything with right arm is more ‘work’ as she describes it. At 2 she had her first AFO. She did initially have PT and it was useful strengthening but she stopped at about 5. They felt that normal physical activities were sufficient. She is still under orthotics and is almost 9. She moved to insoles about 4 mths ago but she has not been reviewed yet. Personally, I think she is turning in a little more and up on her toes more. For the last 4 yrs we have seen the same Orthotics dr and this continuity in care has been great. She is confident and comfortable in his company and we have all built a relationship. We call him ‘Mike the knight’. Before Mike she had seen 4 different Drs. I think the early intervention she received have made a huge difference. I constantly encouraged her right hand into play when she was littlle as I’d been told to and as a determined character she was happy to do. We had many wheelbarrow races around the house and still encourage her to set a new record with hopping on her right leg. And as I have said her orthotic care has been great. Whilst the medical help has been good, information has been poor. Because she is so mild we have never had a paediatrician. Anything I know about the condition has been from the Internet. I love your work and attitude and it has been extremely useful for us. I know we are lucky, as my daughter is so mild but her attitude in ‘not being beaten’ is fab and I see her making new connections in that brain of hers all the time as she tries new things. I remember her collapsing on her right side when she first tried a handstand but that just made her practice more. This summer is about perfecting the cartwheel. She often has a go at writing with her right hand, to make it stronger. Sometimes it gets her down, she can get frustrated and has a huge flare up but she calms down quickly. Thank you for your kind comment. And a big congratulations for all the great parenting that has your daughter where she is today! It is encouraging to all to hear that the hard work is worth it.